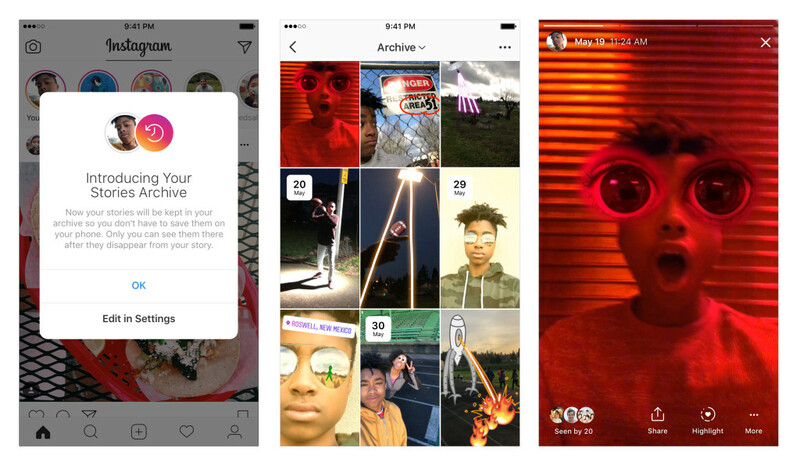 Instagram introduced two new features for its oh-so-popular photo sharing app this week — Stories Highlights and Stories Archive. Stories Highlights is the big new feature, which is a new part of your actual profile that others see. In this space, you can highlight Stories that you’d like others to have easy access to. Basically, if you use Stories a lot, you can make compilation Stories from past videos you have shared. For example, if you want to highlight all of the neighborhood dogs you love, you can keep videos of them right on your profile via Stories Highlights. Stories Highlights appear in a new section on your profile below your bio. To create a highlight, tap the “New” circle at the far left. From there, you can choose any stories from your archive (detailed below), select a cover for your highlight and give it a name. What helps Stories Highlights become a usable feature is Stories Archive. Whenever a Story you’ve posted is expired, it is saved to a private database that only you can access. In this archive, you can tap on any story to watch it. From there, you can add it to a new Story, share it as a post or add it to a Highlight on your profile. If you’re a Stories kinda person on Instagram, go check it out.